Photo above is the big karst rock island that you'll have to circle when approaching the small lagoon. 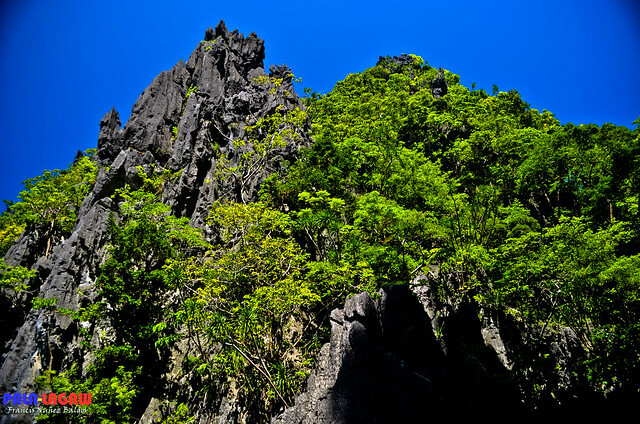 Pardon me as I am yet again posting another blog about El Nido. Just the name of the location is already intriguing and invokes images of a tropical paradise that is at home to us. I can't help it, El Nido in Palawan was the most memorable trip I got last year and it happened again this year, different approach to traveling, different blogging perspective but the same beautiful place. I even took the same tour, but that is more because I want to experience Kayaking again in its azure waters. I've done Kayaking from many other places, yet mostly it is either limited or its just a little exercise from a pool. Maybe next time, I'd finally post about my itineraries. After all, I travel cheap by backpacking these days, and my adventures just doesn't seem to end in experiencing these beautiful destinations the cheapest way for a working class like myself. 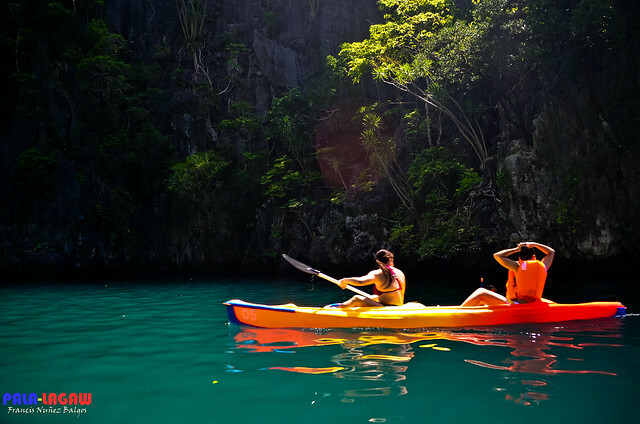 Kayaking in some of the island locations and lagoons allows the guest to explore and photograph the nooks and crannies, hidden estuaries that needed to be discovered. More so, Kayaking is very much friendly to the environment, moving with stealth above silent blue waters, and allows me to get a closer inspection of the sharp looking karst rocks and stagnant pools. My inspiration had always been about photography and the challenges that it poses, seeking the light perhaps or just trying to see a world in whatever grain possible. The reason why Kayaking is recommended but not necessary in Small Lagoon is because boats can't get in there. Of course the guest are ask to swim through the small entrance between sharp rocks. Its impossible for any boats to enter at all, and its also treacherous for Kayakers or swimmers on Spring High Tide, but where is the adventure when you listen to all the talk of caution. 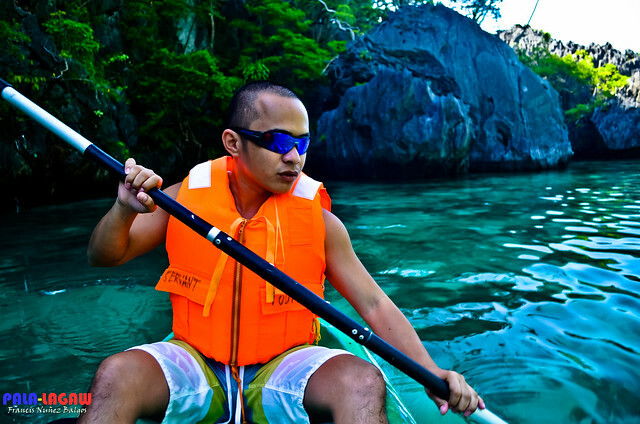 With my travel buddy, we rented the kayak for Php 800.00 for the entire day of island hopping. Once you get past the tight entrance to the lagoon. It's like coming to a great threshold, from the tight opening, the lagoon opens up with high walled karst rock with overhanging canopy's of lush trees clinging through it, like a cathedral, only opened ceiling to the blue sky above, and the floors are varied hues green and blues. You can see from below, or you can't, it doesn't matter, you're in the small lagoon now. I wished it will be renamed aptly rather than saying its a lagoon, generic and without character, so different than what it is from its simpleton name. The price tag for the Kayak felt hefty when I inquired about it, cringing about the dent it would make on my backpacking budget. But there are things that you just had to have, and at the end of the day. It wouldn't matter, you got it, and I'll look back at the Small Lagoon without regret. Inside the Lagoon, it is tranquil, and birds can be heard nesting on the canopy's. Its what I like most about EL Nido's Islands, it is never pretentious, never borrowed and it's unassuming. I look at these locations, and I feel to myself, I've got the gift of a lifetime in here. The tranquility, even with most of the people swimming, struggling with floaters, keeping afar with the depth, the width, they're inspiring even when they look oddly out of place and unfamiliar. grbe ha! hoy ha! sa picture pa lang grbe napanganga me super! ....gnda tlga ! natuwa ako sa reaction mo Kula! hheheh! thanks for visiting! I miss El Nido! I really love the water in Small Lagoon. this place is Alex Garland's inspi on his novel The Beach. 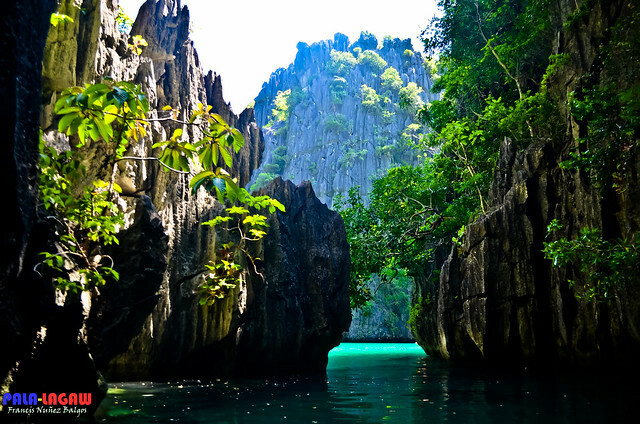 One of the my bucket list, El Nido! 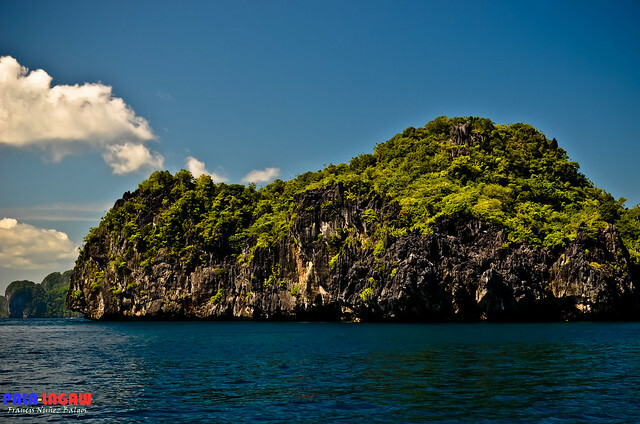 HuWow!El Nido is really one of my dream destinations.. thank you for taking your readers there through you awesome photos! Another El Nido post,yeah,naiinggit ka lang kamo.Don't worry one of these days,I will visit that beautiful place too. 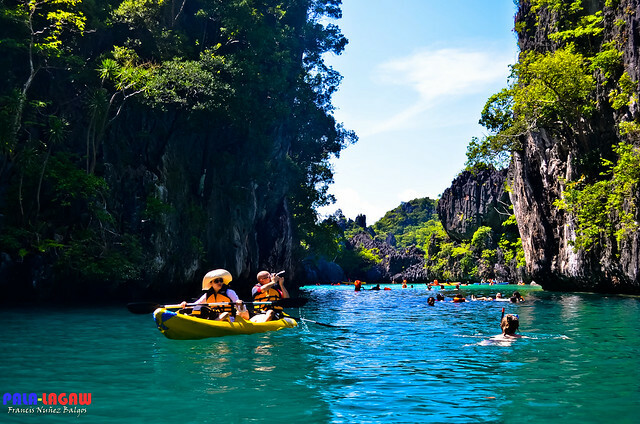 I've been to Puerto Princesa and Coron but not yet El Nido and seeing your photos it does look enticing going there and kayaking in the Lagoon as its a visual treat seeing the limestone formations around. My cousins want to go to the place and do kayaking. I would recommend this one to them and see if we can go there. Ang ganda talaga sa El Nido!!! You're bless to explore the islands by a kayak! I'll put it on "bucket list". hehehe! El Nido is really breath taking. 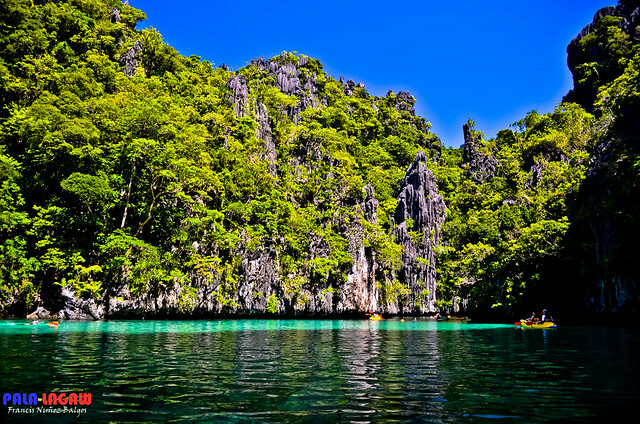 I have this on my bucket list together with Coron and Puerto Princesa. No wonder you love writing about this place, El Nido is breathtakingly beautiful. Well at least I got to see this through your post. Oh, how I wish I could do KAYAKING. I am a bit nervous type of a person. But El Nido, sure WIN. A place to have a good vacation. El Nido is one of my dream destination in the Philippines. Nothing compares to the experience of kayaking in the serenity of the Lagoon! Wow! 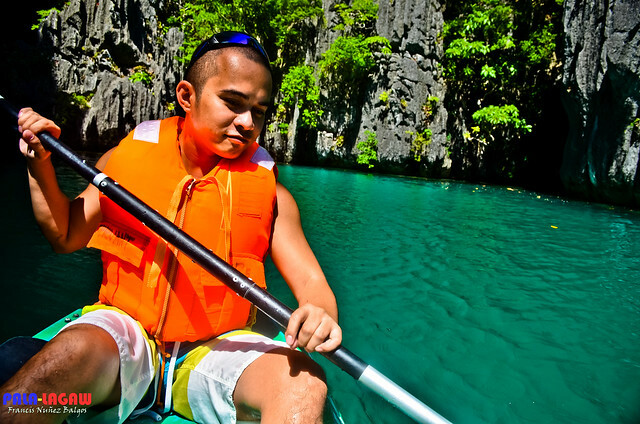 El Nido is truly a haven for Nature-seekers. Kaya nga, I added the place sa Palawan dream travel ko. WoW! Ang ganda naman po ng lugar na toh!! Tsaka ang mga shots mo ang ganda rin po! The photos are mesmerizing. The view the scenery, it's really more fun in the Philippines. Ang ganda! never been to El Nido kaya parang gusto ko ng pumunta agad, now na! seems a very cool and relaxing place. This has been one of my dream destinations. You're so lucky to have visited the place twice while I'm still dreaming of stepping my foot on El Nido. Is it correct to say that it's safer to use the kayak when entering the small lagoon?